The bare, cavernous, gorgeous stage at the Southern Theater. That's about as exciting as it gets in the world of theater - you never know what magic is going to happen in that big open space in front of you. 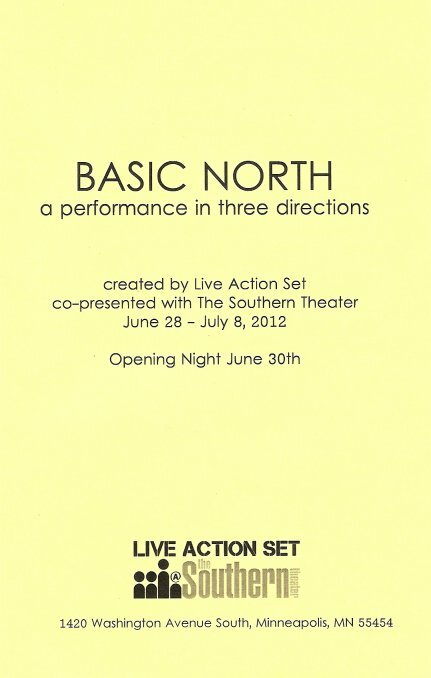 Currently, it's Live Action Set's new creation Basic North: a performance in three directions. But I didn't see three directions, I saw one cohesive piece, where one "chapter" flows into another and back again. I don't want to say too much about the show, firstly because it's difficult to describe, but mostly because it's the surprise factor that makes it so delightful. I really had no idea what to expect, and I was entertained, moved, amused, and yes, delighted by what I saw. 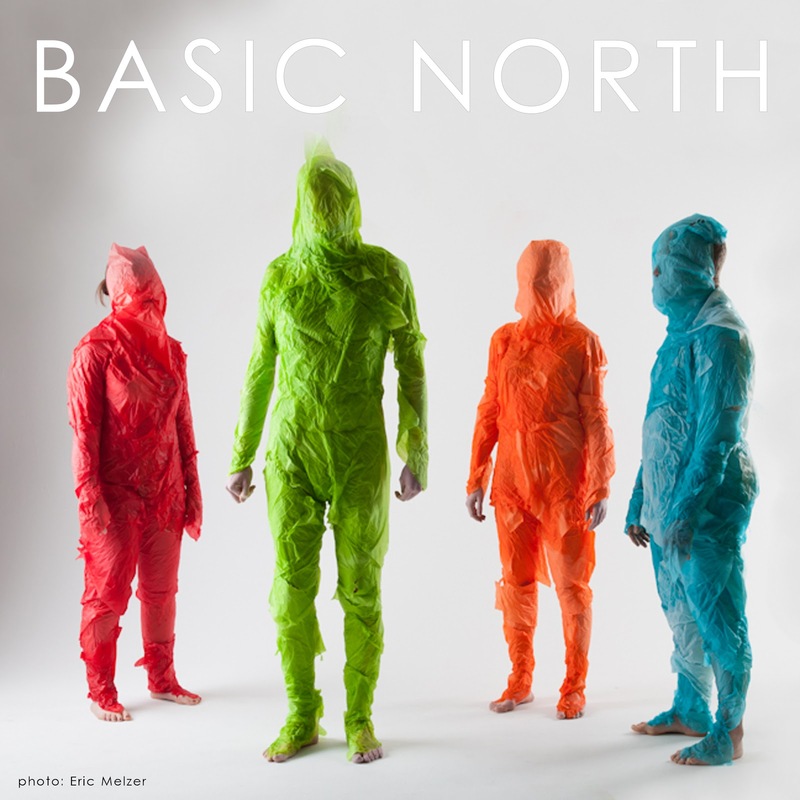 Without Wax: a six-person ensemble (Crane Adams, Artistic Director Noah Bremer, Joanna Harmon, Skyler Nowinski, Tyler Olsen, and Katelyn Skelley) dressed in party clothes and sharing seemingly mundane details about their daily life. Using a technique developed by director Dario Tangelson based on the "neutral mask," each actor looks directly at the audience and speaks with no expression, while the rest of the ensemble shuffles around to stare at them blankly. It's strange and fascinating. Start Select: a dance piece featuring Emily King, Dustin Maxwell, and Stephanie Shirik. I'm not a dance expert so I'm not sure how to describe this, other than it's inventive, expressive, and seamlessly woven into the other parts of the piece (and the bright costumes and wigs are adorable!). Quiet Heart: a solo piece by Noah Bremer, using clown techniques. He opens the show with just a spotlight and a microphone (that he never actually speaks into), which sets the stage for the rest of the show to come. He's so expressive without saying a word, conveying emotions with just the expression on his face or the movement of his body. I'll end this with a quote from one of the performers, Joanna Harmon, who's also the Executive Director of Live Action Set: "It takes guts to say, 'Surprise me! Show me what ya got! Throw me a curve ball,' and with joy, choose to experience a show in which you have never before been immersed." 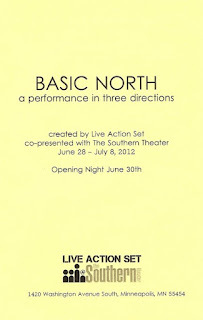 If that sounds at all intriguing to you, then you should definitely catch one of the remaining five performances. And if you missed last year's brilliant and Ivey Award-winning 7-Shot Symphony, you might also want to check out the one-night-only performance of the show, along with a CD-release party (from the bluegrass band Tree Party) on Monday July 2, also at the Southern.